According to new reports, sources are suggesting that Samsung will reportedly announce the next generation of the Nexus 10 atCES 2014. 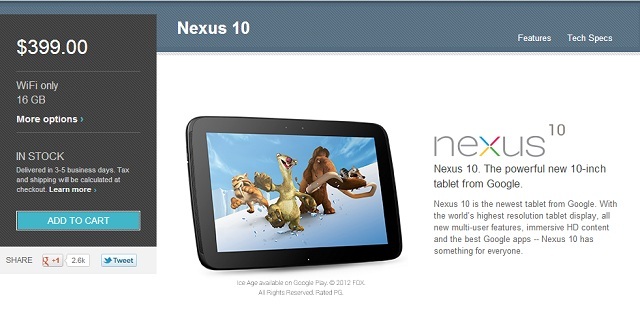 The new Nexus 10 is to retain Samsung as the manufacturer just like the initial Nexus 10 which launched in 2012. Furthermore, sources hint at the device adopting an AMOLED display. The reports come in the light of the Nexus 10 being out of stock with some retailers, and Samsung were rumoured to be working on the second generation Nexus 10 as early as late July. Previous reports hinted at LG manufacturing the next Nexus 10, but it seems unlikely LG will be the chosen company having recently released the LG G Pad 8.3 Google Play Edition tablet recently. However, sources do hint that LG will unveil new tablet products at CES 2014, in addition to offerings from Asus and Lenovo. Asus is said to be showcasing new products featuring support doe a dual-boot environment of Windows 8.1 and Android, whilst Lenovo is said to announce a second-generation of Yoga Android tablets. That basically leaves Samsung as the only manufacturer that is likely to be behind the Nexus 10, and since they manufactured the original Nexus 10, it makes sense for Google to retain the company. Samsung are set to also announce its new Exynos 6 mobile eight-core processor series that will feature 64-bit support, and is set to release numerous tablet models, including a bigger 12.2-inch model. However, with the abundance of Samsung tablets being unveiled at CES 2014, would a new Nexus 10 just be lost in the sea of other tablets? Other than the AMOLED display, there are very little details that have emerged about the next-generation Nexus 10 and when you begin to break down just what will be unveiled at CES 2014 combined with the recent Google Play Edition tablets from other manufacturers, it begins to render another Nexus 10 rather pointless, especially given the first-generation Nexus 10 was never at a low enough price-point. As rumours are, it’s best to take this with a pinch of salt, and although Samsung may well have manufactured at second-generation Nexus 10, it seems the market just doesn’t have room for it at the moment, and CES 2014 sounds quite crowded as it is.